This is the BEST soap ever. Seriously, ever since we discovered Randie Hilliard's Homemade Kombucha soap, my family doesn't use any other! It smells great, contains active Kombucha culture (tea and SCOBY), and rinses super clean leaving your skin feeling soft - never dried out! Homemade Kombucha Soap Ingredients: special blend of cold/expeller pressed and unrefined plant oils of Olive, Coconut, Ethically Harvested Palm Kernel, Rice Bran & Castor with Butters of Shea and Cocoa, Also includes a heavy dose of Organic Kombucha Tea made with Organic Darjeeling & Green Jasmine teas, Organic raw cane sugar and distilled water. SoapPure - Unscented, no added dyes or fragrances, just the faint aroma of Darjeeling and Green Jasmine Teas. All Spruce Up - Black Spruce, Douglas Fir, Scotch Pine, Cinnamon Leaf with French Green Clay to soothe the skin. Whirl-Oh!-Mint - A sweet mint filled with Peppermint and Peru Balsam Resin. Czech Mate - Bayberry, Spruce and Orange mingle in this masculine scented bar. Euca-layleaf - Eucalyptus, Cedar leaf and a touch of lavender with the addition of French Green Clay to soothe the skin. Honey Buzz - Orange blossom honey and soothing oat flour and a hint of bitter almond essential oil combine to create a gentle, skin friendly soap. Lovender - Ahhhhh....Lavender. Soothing, peaceful and calming. This bar is made with a French blend of lavender essential oils. Always a crowd pleaser. Rosey Toes - A soap by any other name...with Geranium, Palma Rosa, Rosewood & Rose essential oils. Pink tinge comes from Maddar root & reef clays. P&L - Peace & Love or Patchouli & Lavender! However you like to think of it - the lavender balances the patchouli nicely for a refreshing scent! Wild Child - A 50/50 blend of Rose Geranium and Patchouli with a hint of cinnamon leaf. This retro bar lightly exfoliates with a ground cinnamon swirl. Gingerous - Ginger, Coriander Seed, ethically harvested Rosewood, Sweet Orange, Grapefruit, Lavender, May Chang, and Patchouli with ribbons of Calendula Flowers. GrassVender - Lemongrass and Lavender unite in this uplifting aroma. Also includes pettigrain, patchouli, palma rosa, peppermint, clary sage and ceder leafe essential oils with spirulina and annatto seed for color. Buying 2 or more bars of Handmade Kombucha Soap? 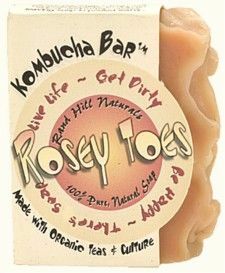 Check out the Kombucha Soap 3 pack for the best deal! Great bar of soap. Smells great and leaves my skin feeling moisturized. This smells wonderful. Love the soap! I love this soap! I've reordered many times. I liked the soap I ordered! I just received my first order of three and was immediately taken away by the clean, pure scent! I couldn't wait for a shower since kombucha NEVER disappoints!! Talk about rockstar lather!!! I love soap that lathers up, but the lather from this soap seems more special! :) The most enjoyable part was feeling how soft and moisturized my skin felt after! I'm hooked after one shower! Here's to the power of SCOBY! Loved the Rosey Toes!!! I am a soap connoisseur 'wannabe' and this was the best soap I have come across so far!! I usually never finish a whole bar before moving on but this one I used to a sliver and reordered 2 more plus another scent - Honeybuzz!! Every order I placed came very fast and all my questions have been answered promptly and courteously. Kombucha Kamp has great customer service along with great products! Lurve this soap! The Wild Child soap is one of my favorites and this is my second bar of that particular scent. The soap lathers well, leaves my skin moist and looking and feeling great! And....it SMELLS GREAT! We don't use a lot of bar type soap. We really like d this soap. the fragrance was not overpowering and the rinse was clean. Very nice! Wow! This soap is the best! I am very picky about the soap I use to wash my face, but this is perfect- it doesn't dry my skin out, it's all natural, it smells beautiful and it has SCOBY super powers!! I've been trying to make the transition to natural body care items and have had massive failures finding a soap that didn't leave an icky residue. This soap is the winner! No icky residue and my skin feels slightly moisturized, not at all dried out. I order the Rosey Toes. I love rose scents. It's a mild and pleasant smell. It doesn't really leave a scent on my body so that will be a good thing for some and a bad thing for others. The soap also has a cool look and shape to it. Not that that really matters, but if you have it displayed that could be a plus. I've had one bar of P&L and one bar of Wild child for over a month. I can't bring myself to use them. They smell amazing. They each lightly scent and entire room, without chemical air fresheners.